Have you ever come across a crack in your glass but can’t seem to figure out where it came from? You are not alone, so we have put together a list of the top five most unusual causes of a cracked windscreen, as well as how you can go about avoiding them and avoiding windscreen repair. Sudden changes in temperature can have a negative effect on the integrity of your car glass. If you happen to be encountering cold weather and suddenly use your defroster, it may cause your car glass to contract suddenly which may, in turn, lead to cracks. It’s best to let the internal temperature of your car warm gradually prior to turning on your defroster to reduce the chance of cracks appearing. When it comes to installing windscreens, there are very high standards that a car glass company must adhere to. If you have tried to do it yourself, or if you went to an untrained garage in order to save a few bucks, you might be suffering from an improper installation. When you drive, there are naturally vibrations that travel to the windscreen, if it has not been correctly installed those vibrations can cause the glass to fracture. You may wonder how too much sun can cause your windscreen to crack when your car usually sits outside in the sun all day. If your car is always in direct sunlight, it can cause the metal to heat up past its usual point which can affect the glass, and cause it to crack along the edges. Always try to park away from the sun to preserve your car glass. Sometimes the glass itself is the problem. There are different qualities of glass, as well as there being imperfections that may have gotten through the quality control section unnoticed. While there isn’t much you can do to prevent getting car glass that has a hidden imperfection, you can make sure that you always have the highest quality car glass by only purchasing OEM products. Pressure is one of the most common but unexpected reasons for cracked windscreens. Sudden winds, changes in altitude, or even putting heavy items on the windscreen can result in cracks to your car glass. When you first notice any damages or cracks on your windscreen, it’s important to have them repaired. What can be a small inexpensive repair has the potential to turn into a costly replacement if left unchecked. 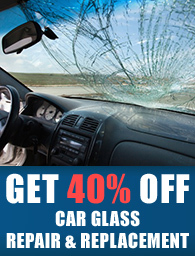 Call our office at 7707550375 right away to speak to one of our highly trained car glass repair professionals. We can determine if your windscreen can be repaired, or if you need a replacement. Fast Car Glass offers mobile services, so for simple cracks and chips, you can expect to be back on the road in an hour or less.